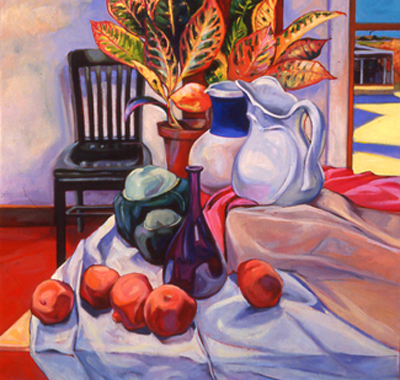 Painting a still life lets me spend time looking at things I like—shinny glass objects, colorful patterned fabrics, flowers, vegetables, fruits, plants—whatever strikes my fancy. I get a chance to arrange the small world where they live, placing things where I want them and adjusting the lighting to my specifications. Knowing they're going to stay put, I can take all the time I need. It's a quiet, relaxed world with no other demands other than what I've imposed on it myself. Here I can ask my own questions, solve my own puzzles, investigate freely and calmly, and enjoy the process of looking, transforming and translating what I see, making it my own special universe.